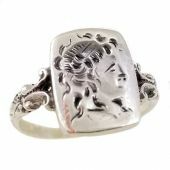 The exciting and new collection being offered for lovers and collectors of Victorian jewelry. 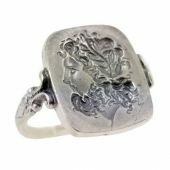 Before modern jewelry casting technology was available in the early 1940's, most jewelry was die struck. The process involved some of the finest hand engravers of the time engraving these exquisite designs into blocks of steel called hubs. 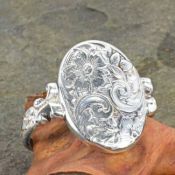 Using a combination of techniques from the past and present these fabulous designs have been brought back to life in such a way that even the original tool marks hand engraved over a 100 years ago are left intact and preserved as part of the history and charm of your ring. Having over 3000 hubs of different designs making up an incredible new collection that includes mid Victorian era themes, late Victorian whimsical designs, Art Nouveau florals and more. 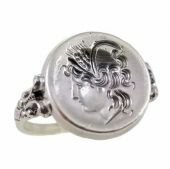 Mens' or lady's unisex ring. Manufactured per order using original hand carved hubs from the 1800's. Manufactured per order using original hand carved hubs from the 1800's. 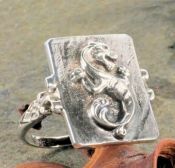 Gents sea serpent ring. 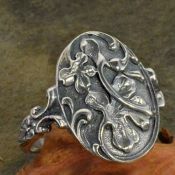 Manufactured to order using antique hand carved dies from the 1800's. 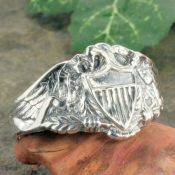 Manufactured to order using original hand carved hubs from the 1800's. Featuring a wingless dragon mythical creature. Manufactured to order using the original antique hand carved die from the 1800's. 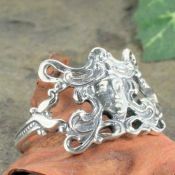 Manufactured to order using original hand carved dies from the 1800's. 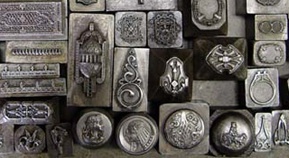 Manufactured to order from the original antique hand carved dies from the 1800's. 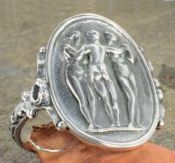 Manufactured to order using a mold of the original antique hand carved die from the 1800's. Featuring detailed floral and foliate embossing. 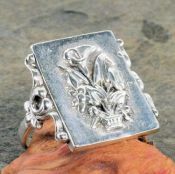 Manufactured to order using a mold of the original antique hand carved die from the 1800's. 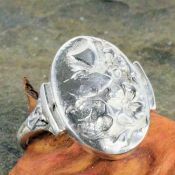 This patriotic American Eagle ring is Unisex and can be worn as a gents or ladies ring. Manufactured to order using the original antique hand carved die from the 1800's. 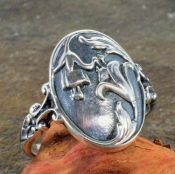 A dainty ring perfect to wear as a pinky ring. Manufactured to order using the original antique hand carved die from the 1800's.